It’s even better than the much loved 26in version. It’s bloody expensive and there’s no size XL for taller riders. Here is one of the most eagerly awaited mountain bikes ever. Everyone knew that Specialized would upgrade its classic 26in Enduro to 650b, it was just a matter of time. Well, it’s finally here… but the bike is not entirely new. At the launch in Oregon, Specialized made no secret of the fact that the new 650b Enduro uses the old 26in Enduro front triangle along with a dedicated 650b rear end. 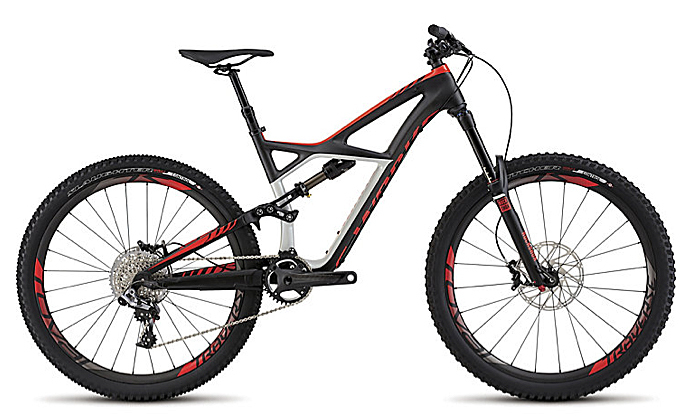 It’s a similar approach to the recently released Stumpjumper Evo 650b, but this time it works in Specialized’s favour. The bike is really well balanced and the one-degree slacker head angle on the 650b version is exactly what the doctor ordered. All of its other vital stats remain largely unchanged: it still has 165mm of travel on the rear (10mm more than the 29er) and short 422mm chainstays. It also retains the more progressive suspension layout that was introduced a couple of years ago on the 26in bike. Strange then, that the 650b version I rode bottomed quite easily when running more than 20 per cent sag on the Cane Creek DBInline shock. The bikes were all pre-production, so hopefully Specialized will get a bigger volume reducer in the shock before it hits the high street. Cost saving is an obvious benefit to using the old 26in front triangle, but are there any downsides? Yes, the main one being that there’s still no XL option. Also, Specialized has missed the opportunity to engineer a dedicated 1×11 frame with a wider stance for the main pivot. With four complete bikes in the line, prices start at £2,600 for the aluminium Comp model, rise to £3,600 for the Elite, jump to £4,600 for the Expert Carbon and top out at £7,000 for the S-Works bike featured here. All models get 1×11 drivetrains and RockShox Pike forks. There will also be an S-Works frame-only option for £3,000, but Specialized has no plans to offer 650b hop-up kits to existing 26in Enduro owners. At the launch at Hood River, Oregon, I jumped at the opportunity to ride the 650b and 29er S-Works Enduros back to back. Why wouldn’t I? With both models decked out in identical finishing kit, including the new Roval carbon wheels, XX1 drivetrain, Specialized’s hollow carbon chainset and RockShox Pike fork, it’s not like I was going to draw a short straw. That said, the difference in handling between the bikes was striking. With a much slacker head angle and lower effective BB due to the extra 10mm of travel on the rear, the 650b Enduro felt like a mini downhill rig focused on gravity-fuelled thrills rather than a pumped-up trail bike. With 26in out of the picture, the gap between wheel sizes has narrowed somewhat and so the differences in attitude on the trail arose from the geometry rather than wheel diameter. With a much slacker head angle and lower effective BB due to the extra 10mm of travel on the rear, the 650b Enduro felt like a mini downhill rig focused on gravity-fuelled thrills rather than a pumped-up trail bike. So while the 29er is certainly pushing the boundaries of what’s possible with bigger wheels, it’s building on an XC/trail riding perspective rather than feeling like a stripped-back DH bike. that decision was based on the terrain I’d be riding on. If Specialized had launched the bikes at a race in a French alpine ski resort I may well have chosen the 650b bike instead. Horses for courses, I suppose. Either way, Specialized has got it covered. The S-Works Enduro 650b rolls on a set of new carbon Roval wheels. With a 30mm internal width, the Fattie rim gives the tyre a much squarer profile and makes it more stable at lower inflation pressures. Out on the trail that translates to less tyre squirm and burping when cornering hard. Wider rims alone don’t reduce the risk of puncturing, however, so getting the optimum set-up is still about finding a balance between tyre casing, inflation pressure, rider weight and the terrain that you ride. The new wheels sport Roval’s Zero-Bead Hook rim design and have 24 spokes front and 28 rear. Available in 650b and 29in, claimed weights are 1,530g and 1,570g respectively.